Only God knows why Mali matters so much to the French, British and other European "Friends of Syria," and not the decimation of 21 million Syrians. Only God knows why the U.S. and Israel's saber rattling at Iran -- which has just given Syria a credit facility of $1 billion -- evaporated. Only God knows why Russia -- which vetoed so far three UN Security Council draft resolutions threatening Damascus with sanctions -- this week endorsed a unanimous UNSC statement backing France's intervention in Mali. Only God knows why Algeria -- which has consistently opposed intervention in Syria -- allowed French jets to use its airspace to intervene in Mali. More than 100 people were shot, stabbed and possibly burned to death in the Syrian city of Homs this week, in what a monitoring group said was a massacre by the army or militia loyal to President Bashar al-Assad. The Britain-based monitoring group said women and children were among the 106 people killed by forces who stormed Basateen al-Hasawiya بساتين الحصوية, an impoverished district on the edge of town. (Read Reuters dispatch). The Syrian League for Human rights (SLHR) says more than one million Syrians – men, women and children – have been arbitrarily detained since the beginning of anti-government protests in mid-March 2011. It says in a report 99% of them were tortured or otherwise ill-treated. Some were subjected to enforced disappearance. It put the number of deaths under torture at 1,350. The figure excludes summary executions at homes, on the streets or at checkpoints and roadblocks. SLHR estimates the present number of detainees at 165,000, about 6,000 of them females. Six hundred and seventy (670) students currently study in United Kingdom higher education institutions. Many have been threatened by their universities with immediate expulsion – some have already been expelled – if either they or their sponsors can no longer pay for their tuition fees, due to the conflict in Syria. Syrian students in that case would then lose their student visas and their right to work, leaving them in impossible situations. Also, the Syrian Government -- under the British Council’s Capacity Building Scheme -- sponsors at least 100 Syrian PhD students in the UK, and the Syrian authorities have stopped their funding and maintenance payments. This has left these students in limbo, as they may not be allowed to complete their studies. The lives of these 670 Syrian students are threatened – those who would lose their UK visas would be forced to return to Syria. And if they are suspected of taking part in protests against Assad's government, they could face detention, torture and even assassination at the hands of the Syrian regime. The Foreign Secretary William Hague can ensure that Syrian students are able to continue their studies in the UK, including those who have already been expelled – like he did for the Libyan students affected by the conflict in 2011. Let's call on him, the Universities Minister David Willetts and his colleagues in Scotland to do the same for Syrian students. Please sign and share this petition widely! By this writing, the number of signers had exceeded 25,000. You can add your signature here. I have one statement at the top, and then we’ll go to what’s on your minds. 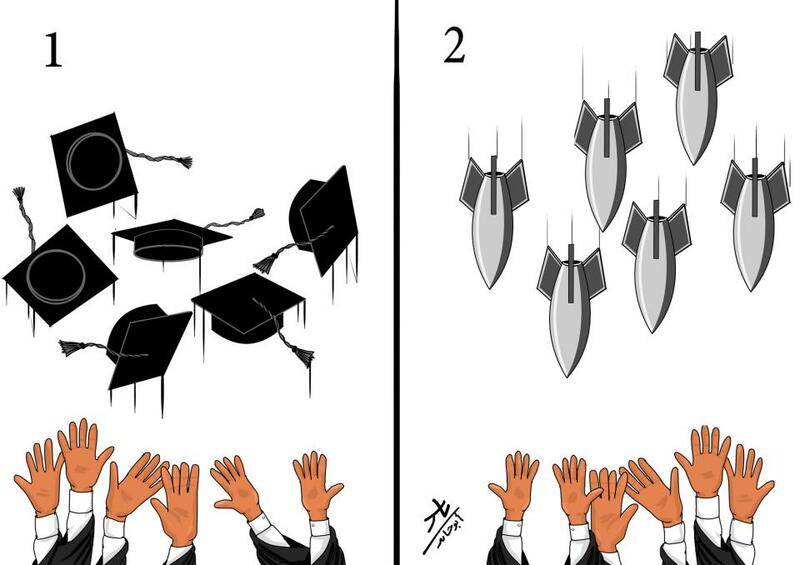 This is with regard to the deadly attack on the University of Aleppo yesterday. The United States is appalled and saddened by the Syrian regime’s deadly attack yesterday on the University of Aleppo, which reportedly killed more than 80 people and injured more than 150. According to eyewitnesses at the scene, regime planes launched aerial strikes on university facilities. We understand that most of the victims of this tragedy were students and refugees who had been housed at the university. We condemn this despicable attack on unarmed civilians and continue to emphasize that those responsible for unlawful killings and other violations of international law will be identified and held accountable. Our sympathies and condolences go out to all those devastated by this senseless tragedy. The Syrian people have already endured too much loss as a result of the Assad regime’s relentless attacks on its own people. The Obama administration is still trying its hardest to shoot down a secret U.S. diplomats’ cable saying the Syrian military dropped an exotic chemical weapon on rebels during a December 23 attack in the city of Homs.